Lulu City condominiums are on the corner of Mahoney Drive and W. Pacific Ave., just 100 yards to Lift #7. 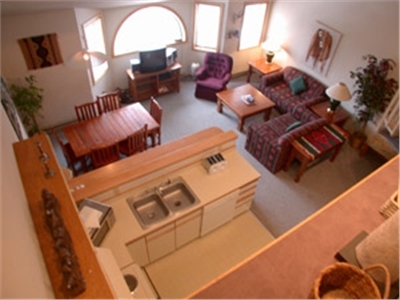 This 2-bedroom/2-bath condo has a queen, queen and bunk bed, 2 queen sleeper sofas. You enter the condo from the second floor and there is one level to the condo. 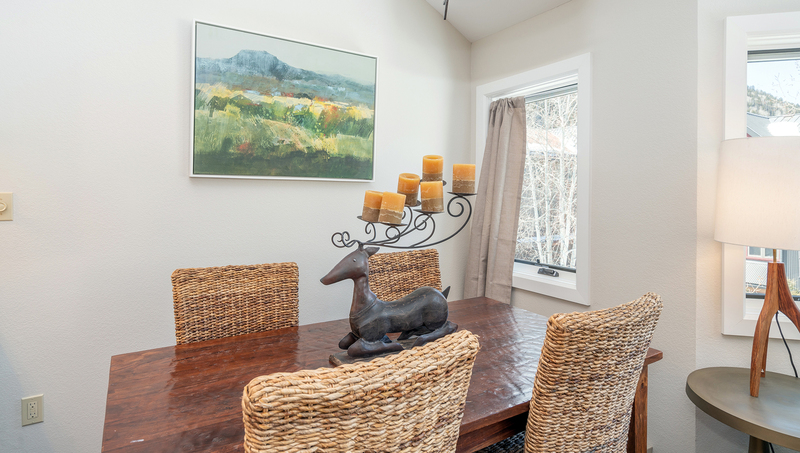 As you enter the living room, kitchen and dining room are to your right. 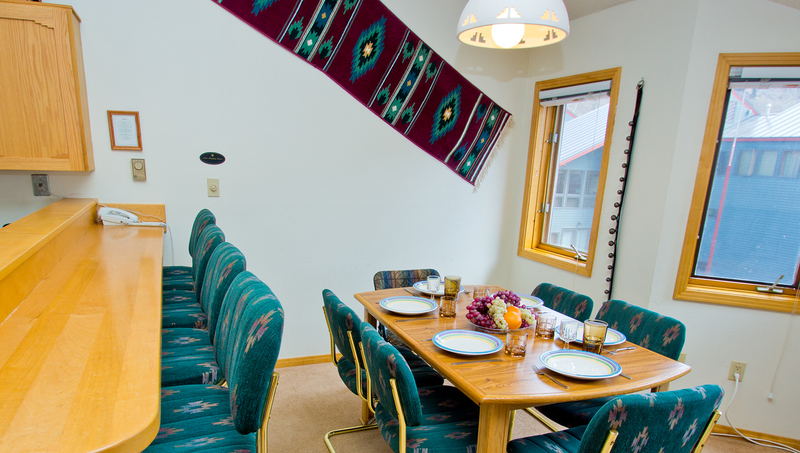 In the living room you'll find a queen sofa-sleeper, TV w/VCR and DVD; the dining area seats 8. There is an enclosed balcony off the living room serves as a den with a queen sofa-sleeper and is right off the dining area. To the right of the entry is the master bedroom with a queen bed and private bathroom with shower/tub combo. Views from the room look into the courtyard where the hot tub and seasonal swimming pool are found. The second bedroom has a queen and a bunk bed, as well as private bathroom with steam shower only (2 shower heads) and double vanity. This unit has its own washer/dryer. The complex provides a common hot tub, a pool (summer only), and complex covered parking. 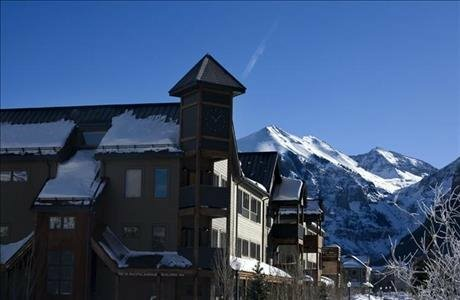 Across the street from the base of Lift #7 and a 10-minute walk from downtown, this 3 bedroom/2 bathroom condo is a great value. 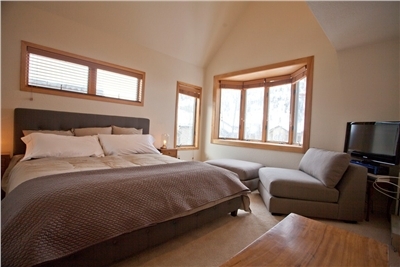 It has a king bed in the master bedroom and a queen bed in the 2nd and 3rd bedrooms and queen sofa-sleeper. Enter the condo from an interior stairwell, from the ground level using the door labeled 5bl. Directly to your right when you walk thru the door is a shared bathroom with a shower/tub combination and granite countertops. Across the hall from the bathroom you'll find the 2nd bedroom with a queen bed and basic TV and the 3rd bedroom with a queen bed and TV. Upstairs in the living room is a small flat-screen TV with DVD, CD stereo, iPod dock, queen sofa-sleeper, and views to the west of the Valley Floor and north to the ridge. 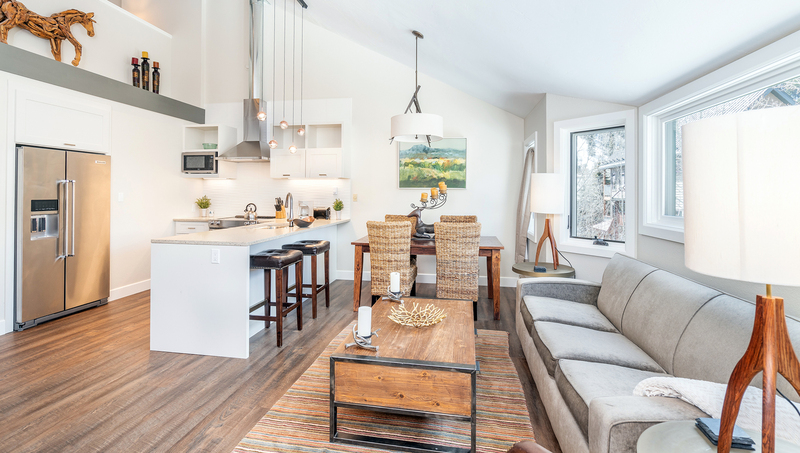 Open to the living room is the dining area which seats 7, and a full kitchen with granite countertops, stainless steel appliances and a walk-through layout. You'll find the DSL internet at the phone in the kitchen. Also on this floor is the master bedroom with king bed and attached bathroom with jetted tub and separate shower. This bathroom is also accessible from the hall. The complex has a common outdoor hot tub and summer-only swimming pool in the central courtyard. There is ground-level parking, and this unit also has a private 1-car garage. Ski lockers are located indoors on the ground level Being located just across Pacific Avenue and the San Miguel River from the base of Lift #7, ski access is a short walk away. Historic downtown is accessible by a 10-munute walk or by free in-town shuttle which stops just outside. 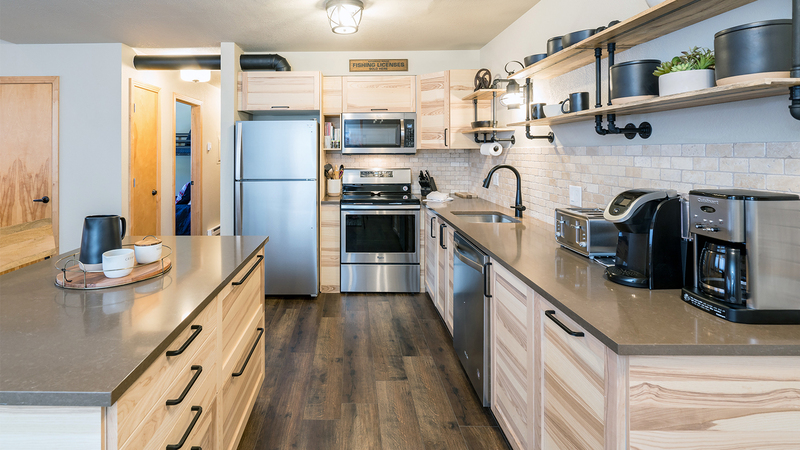 This condo was completely remodeled and completed in December 2017! 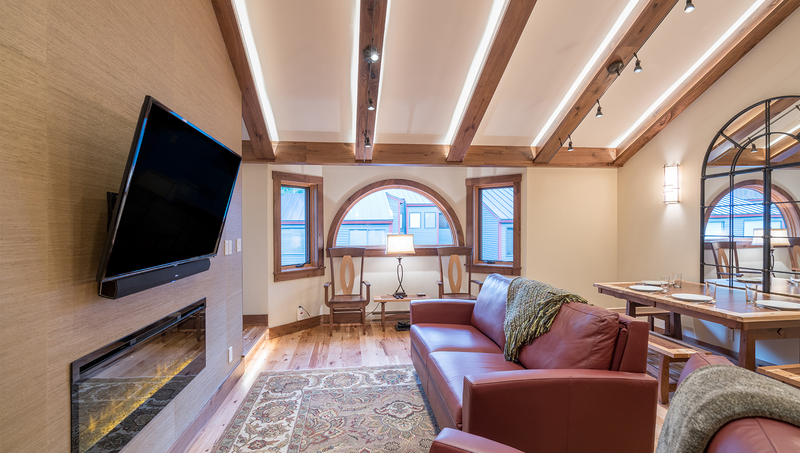 Lulu City condominiums are across the street from the San Miguel River and Lift #7, making them a perfect location for skiing and a nice leisurely 10-minute walk to downtown Telluride. Bedding includes a queen, captains bunk bed, and a queen sofa sleeper. You enter the single level condo from the 2nd floor. 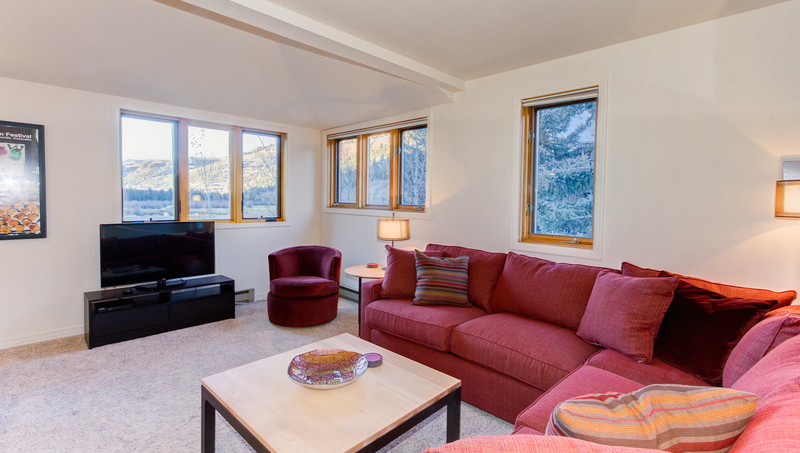 The newly remodeled (December 2017) living room features a 42 inch HDTV flat-screen TV with Roku and Netflix streaming as well as HBO, DVD/ VHS player, CD player, queen sofa-sleeper, and views of the open Valley Floor to the west (sunset views). 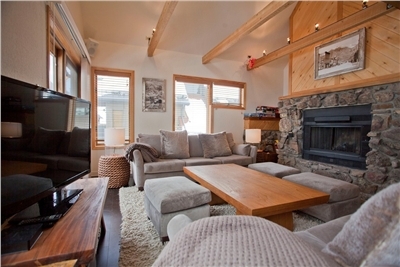 Open to the living room is the full kitchen and dining area that seats 4. There are also 2 bar seats at the kitchen island. The kitchen has top of the line decor and professional grade cookware. It also features a Keurig coffee maker, regular coffee maker, waffle iron and mixer. From the entry, the bedrooms are to the right. 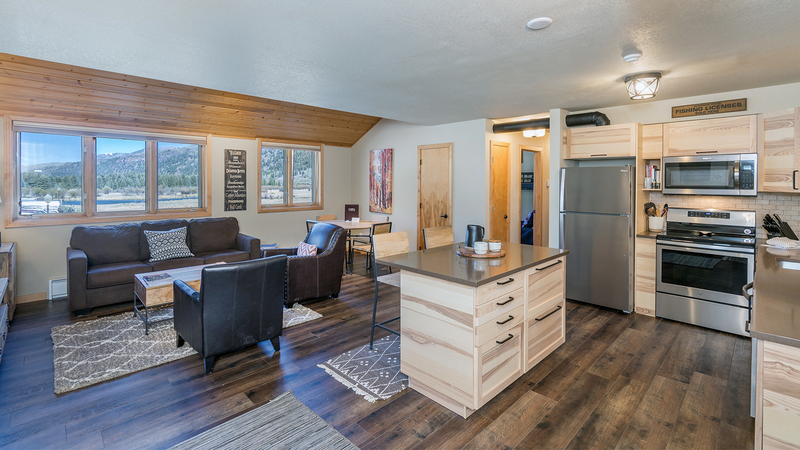 In the master bedroom is a queen bed, 20 inch flat-screen TV with Roku and Netflix streaming as well as HBO, and private bathroom with a large walk-in shower with river rock pebble floor. Down the hall is the second bedroom with a twin-over-double bunk bed (captains bunk) and 20 inch flat-screen TV with Roku and Netflix streaming as well as HBO. The second bathroom has a shower with river rock pebbles. Each bedroom features black-out shades as well as humidifiers and fans. The unit has a washer/dryer in the hallway and wireless internet. There is a ski locker outside the front door. The complex provides one common outdoor hot tub, pool (summer only) in the courtyard, and covered parking. The free town shuttle passes by here, though downtown is only a 10-15 minute walk away. Jen and Steve would like to welcome you to their home and hope you enjoy Telluride as much as they do. 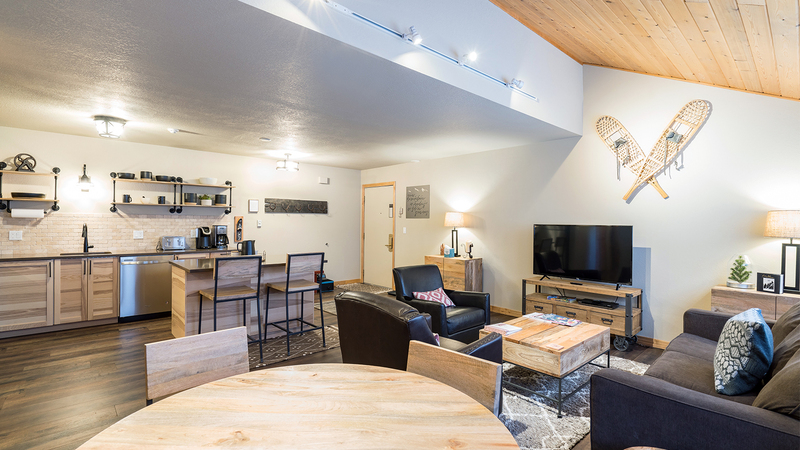 A short stroll across the river from the Coonskin Lift at the base of the ski mountain, the Lulu City Condos offer in-town convenience. This 2-Bed/1-Loft/2.5-Bath condo underwent an extensive remodel in 2015 in order to create the most luxurious Lulu City unit in existence. Bedding: King, Full, Queen, Queen Sleeper Sofa. The entry hallway to this condominium is spacious, allowing plenty of room to store your gear, and contains the half bath that serves the main living level. Passing through the entry hall takes you into the living room, featuring impeccable walnut floors under soaring vaulted ceilings with views of Ajax and Ballard Peaks filling the windows. 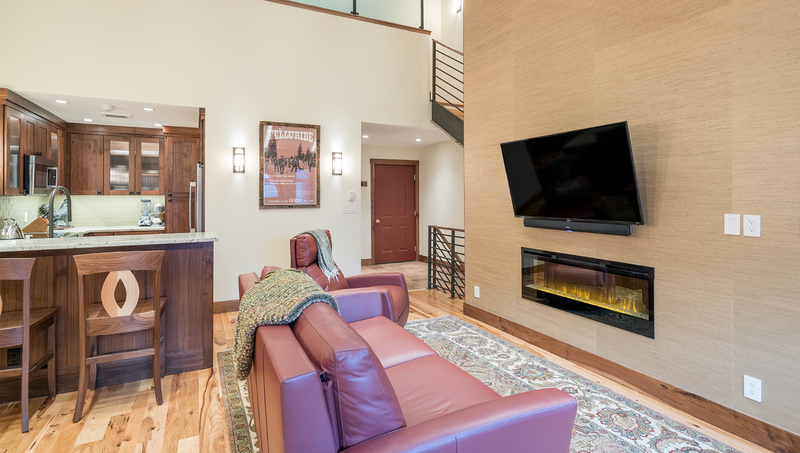 The furniture is leather and inviting and the large flat screen TV is mounted to the wall above a contemporary gas fireplace. The sofa contains perhaps the nicest pull-out queen bed known to man - a memory foam mattress and no support bars to wreak havoc on your back! 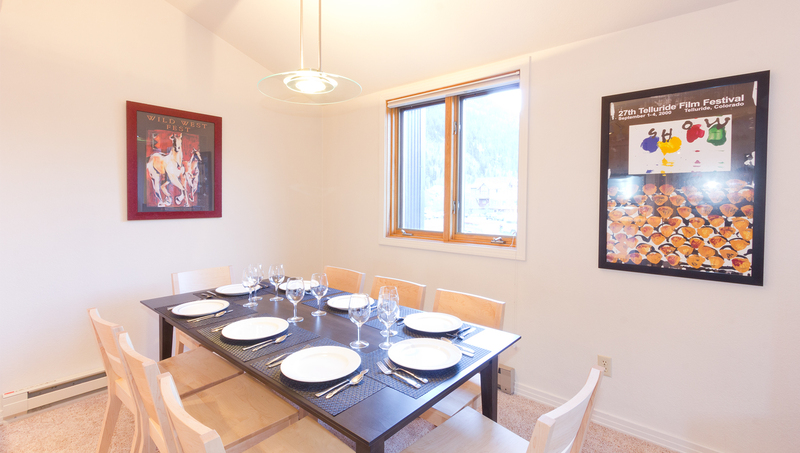 The attached dining room contains a custom Amish table that expands to accommodate seating for six. The kitchen features a two-temperature wine cooler, granite counters, stainless steel appliances and an abundance of storage. 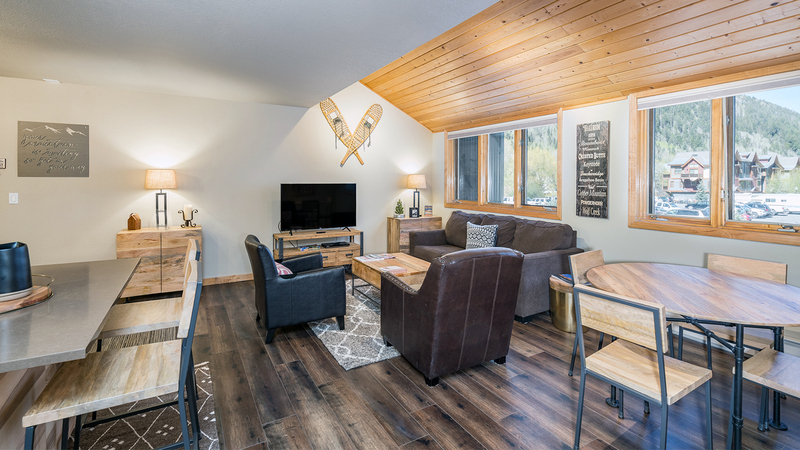 Up one level brings you to the loft, a space set up as the Guest Master Suite, replete with queen bed, flat screen TV, plenty of storage and en suite bath. 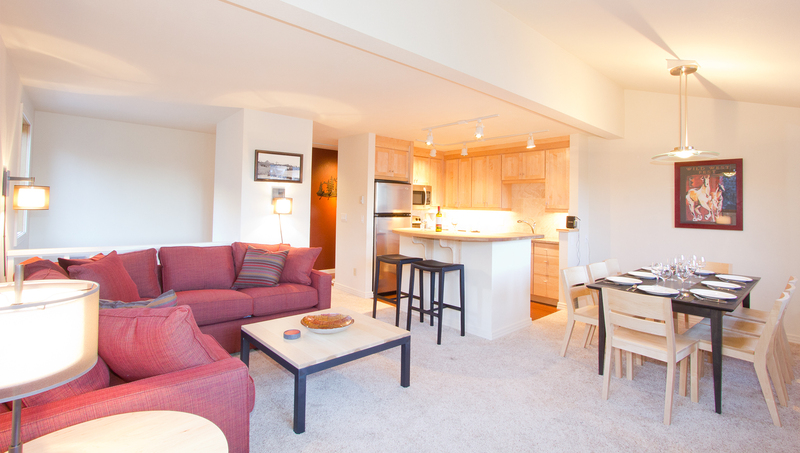 One level down from the living areas brings you to the hallway serving the two bedrooms. The hallway contains the private laundry facilities under the stairwell, right beside the unique boot-washing station. The Master Bedroom has a flat screen TV, ample storage, egress out a second lower entry, and an all-natural Hastens king bed form Sweden. The Master Bathroom contains double vanity sinks and an oversized steam shower. The second bedroom has a full bed and a flat screen TV. This bedroom can convert into an office with large desk and wireless printer with just an easy flip of the bed. Lulu City's common areas boast a swimming pool (summer only) and an outdoor hot tub. 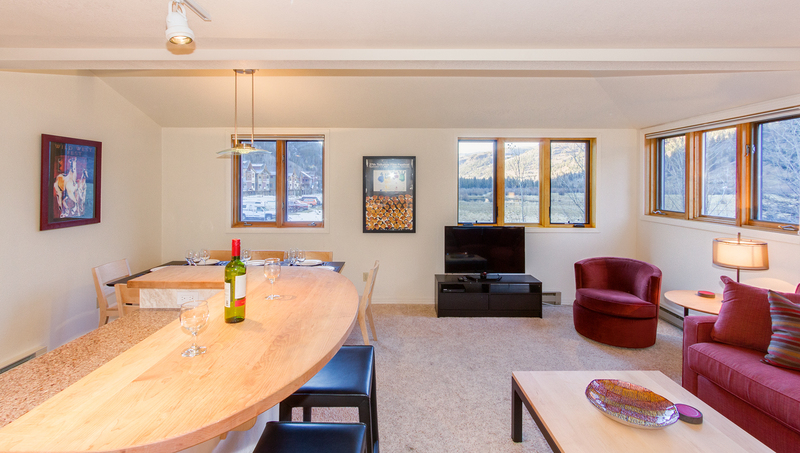 There is one parking space in the covered garage as well as a ski locker for guest use. Lulu City 6I has wireless Internet and a state-of-the-art AV system. 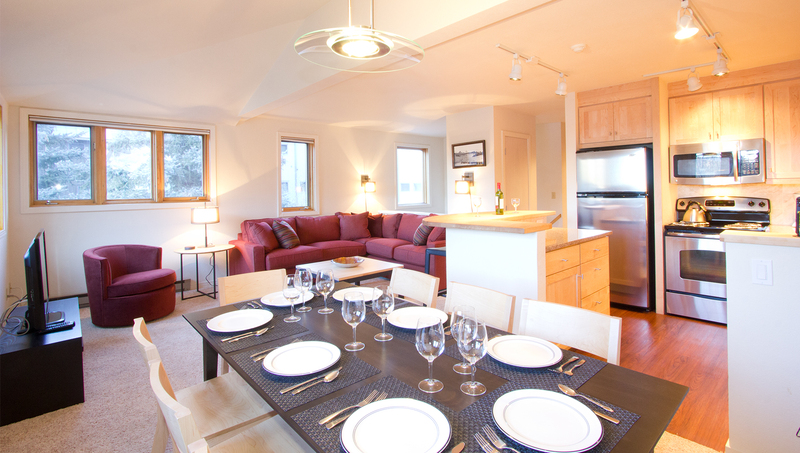 Guests will appreciate the luxurious furnishings and fresh feel of this remodeled gem. 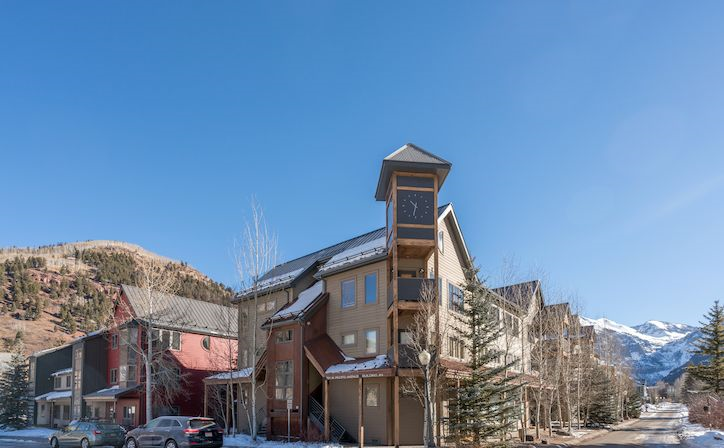 Just across the street from the San Miguel River and the base of Lift #7 (Coonskin lift), this 2-bedroom with Loft/3-bath condo is a great value with in-town convenience. It has a queen bed, 2 twins in the second bedroom, 2 twins in the loft and twin sofa sleeper. Entering this condo from the 2nd floor entrance, you'll first encounter the bedroom with 2 twin beds that can be made up as a king bed. Just down the hall is the 2nd bedroom with queen bed, TV, and private bathroom with steam shower only. Upstairs is the main living area. 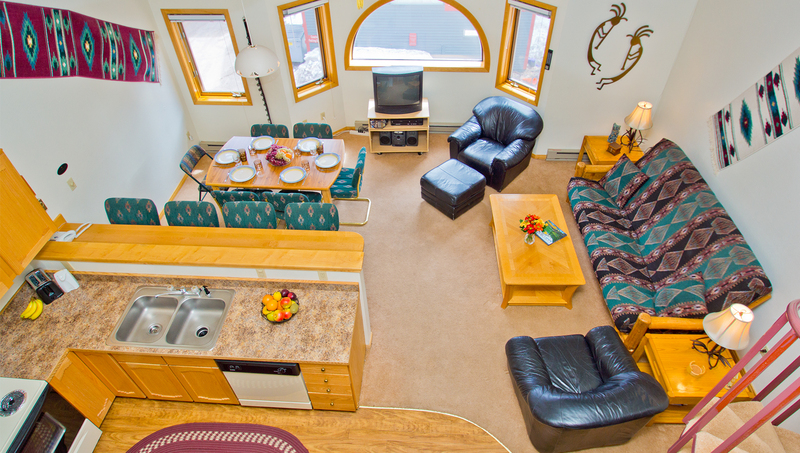 The sitting area includes a twin (loveseat) sofa-sleeper, 20" TV with DVD and CD stereo. 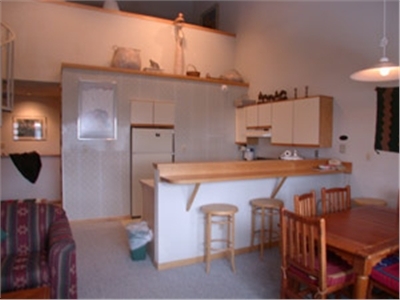 The dining table seats 6, and the kitchen is open to the whole room with a breakfast bar with 2 stools. 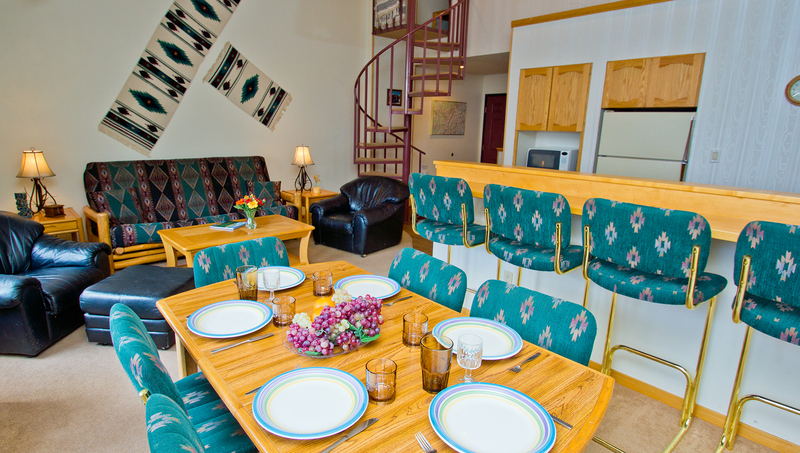 Up the spiral stairs is the loft where two twin beds are located. 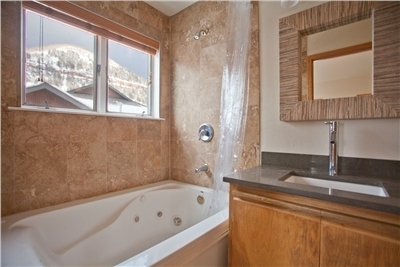 You'll find the master bathroom on the main level, with jetted tub and shower. On the hall is the stack washer/dryer. This unit also has internet service. In the central courtyard is the swimming pool (summer only) and outdoor hot tub. Garage parking is on the ground level of this building, as is the unit's ski locker. To the south of the complex is the base of Lift #7, and historic downtown can be reached by a 10-minute walk, or free in-town shuttle that stops here. 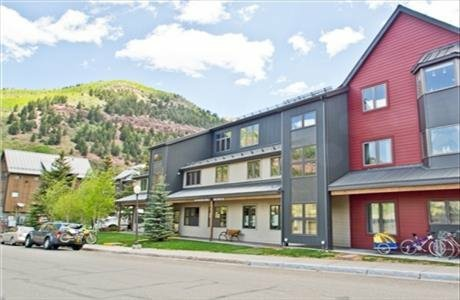 This brand-new stunning remodel provides comfort and accessibility in a prime Telluride location! The Lulu City condominiums are situated across the street from the San Miguel River and just 100 yards away from Lift #7. 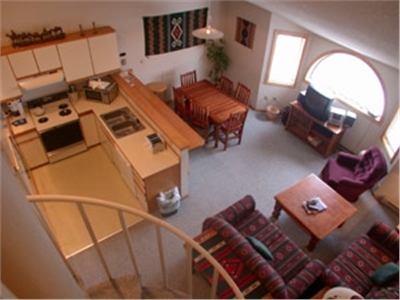 Upon entering this condo, you're greeted by a staircase to the main living space and two bedrooms on the first floor. The first bedroom is adorned with a beautiful charcoal queen bed with luxurious bedding and a small sitting area. Three windows provide plenty of light. 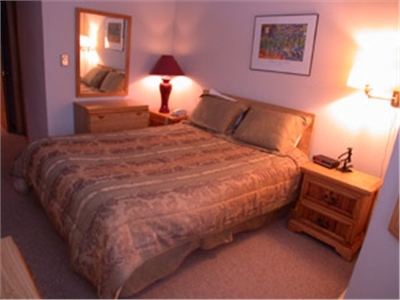 The second bedroom has a queen bed, flatscreen TV and ensuite bathroom. The bathroom has a spacious walk-in shower with waterfall showerhead and large modern vanity. There is a stackable washer and dryer on this floor. 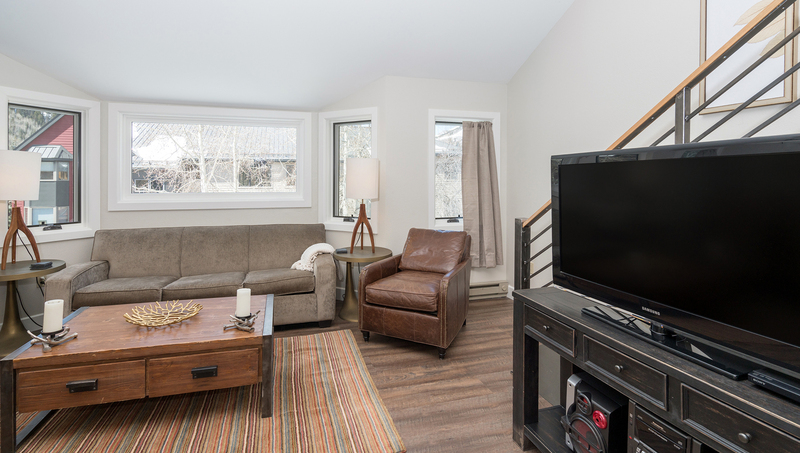 Upstairs is the open living space with vaulted ceilings and a wall of windows, allowing plenty of light to flow in. 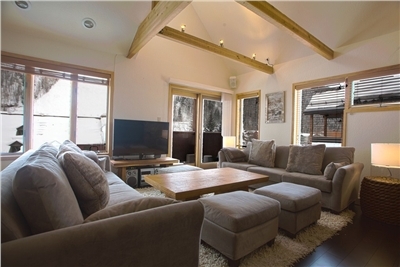 A comfortable sitting area is situated at the top of the stairs - perfect for getting ready for a day on the slopes or for storing gear. The spacious living area has a large flatscreen TV, stereo, DVD player and a pullout queen-sized sofa sleeper. It is open to the dining room and kitchen, which has seating for four at the dining table with two additional stools at the breakfast bar. 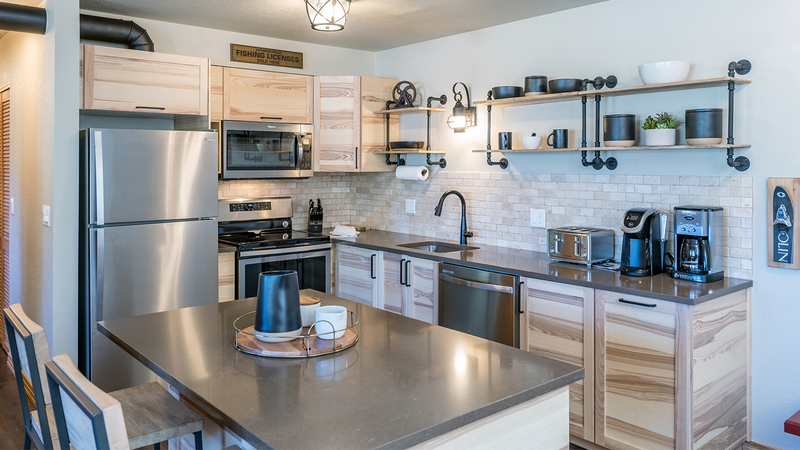 The modern kitchen provides guests with the convenience of cooking entire meals right at home! 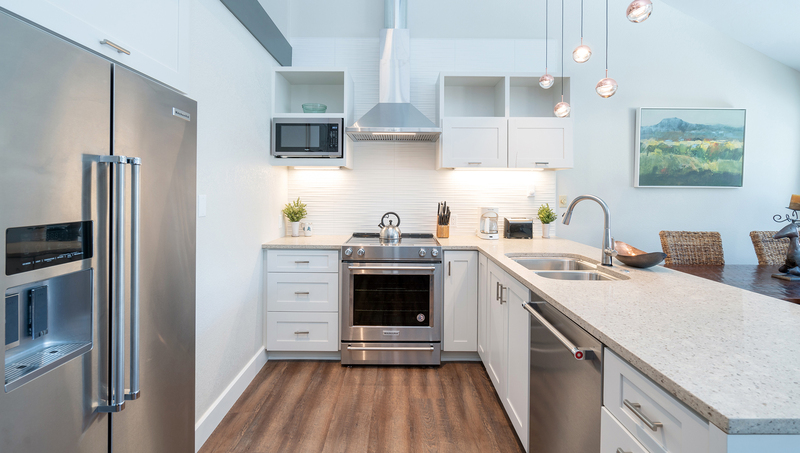 Stainless steel appliances and sleek countertops make cooking a delight. An open mountain-modern staircase leads to a lofted sleeping area with two twin beds. 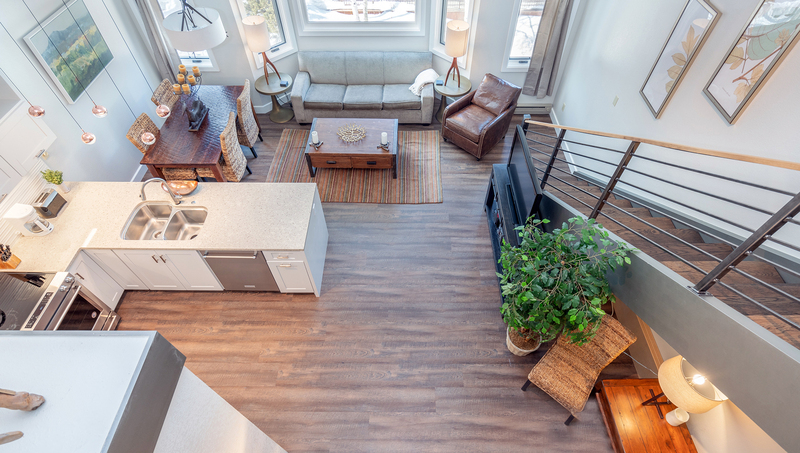 This space is open to the living area below but is a great space for extra sleeping accommodations. The complex provides a common hot tub, a pool (summer only), and complex covered parking. 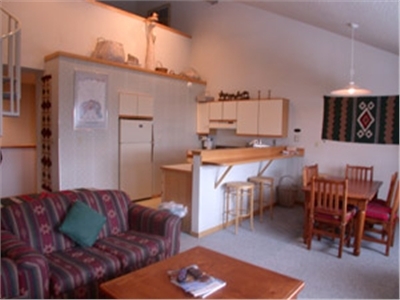 The condo has wireless internet and a ski locker on the ground level. 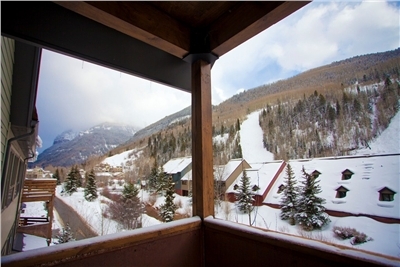 Lift #7 (Coonskin Lift) is across the street, and downtown historic Telluride is a 10-15 minute walk.